What do Mahatma Gandhi, Uncle Fester, Charlie Brown and a punk rocker with a Mohawk all have in common? They’re all Halloween costumes I have seen at Rush, worn by pediatric cancer patients as a means to cope with their illness by using humor. And it’s not just kids that do this. A 42-year-old former bone marrow transplant patient came to my office to make a donation to the Child Life Program. While he was there, he regaled me with stories about how he played jokes on hospital staff doing such things as affixing plastic insects to his port site, drinking apple juice out of a urine cup in front of an unknowing nurse, and writing a funny message on his stomach under his gown before going off to surgery. He had managed to find humor in the experience of a life-threatening illness and grueling procedure. And it was clear to me in our conversation that it helped him cope with the many challenges he faced. What did he donate? A case of wind-up chattering teeth. Caring for sick people is no laughing matter. 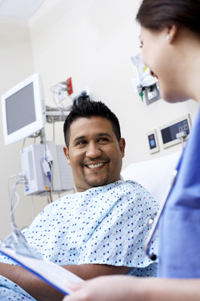 However, caring for patients using humor and laughter (appropriately) is a recognized intervention in their treatment. The saying “laughter is the best medicine” is an age-old quote. But with the current emphasis on evidence-based practice, it is good to know that there is a large body of empirical evidence proving it. Research supports the benefits of humor in lowering blood pressure, reducing anxiety, mobilizing the immune system, releasing anger and managing pain … just to name a few. Therapeutic humor is an evidence-based, cost-effective intervention with no known side effects. Rush recognizes the importance of humor by sponsoring its first (hopefully annual) “Therapeutic Humor Week,” which starts today. The goal of this event is to increase health care professionals’ awareness of the psychological and physiological benefits of humor. There is an array of activities planned, including an inservice with continuing education credits on the theory and practice of using humor, a laughter yoga session, and interactive demonstrations of the therapeutic use of improvisational theatre and magic. Our hope is that these events will foster a greater use of humor as a coping strategy for patients and health care professional working in a stressful environment. Innovation is the “I” in the Rush I CARE values. Finding innovative ways to use humor therapeutically with patients — and each other — is another means through which we can live our values and provide excellent patient-centered care. Robyn Hart is director of Child Life Services at Rush University Medical Center. This is an excellent article! The story about the cancer patient who donated chattering teeth clearly demonstrates the point, and in the face of serious illness, what’s better than a treatment that is low cost and has no side effects! Bravo to Robyn Hart for writing this engaging piece and initiating a “Therapeutic Humor Week” at Rush.